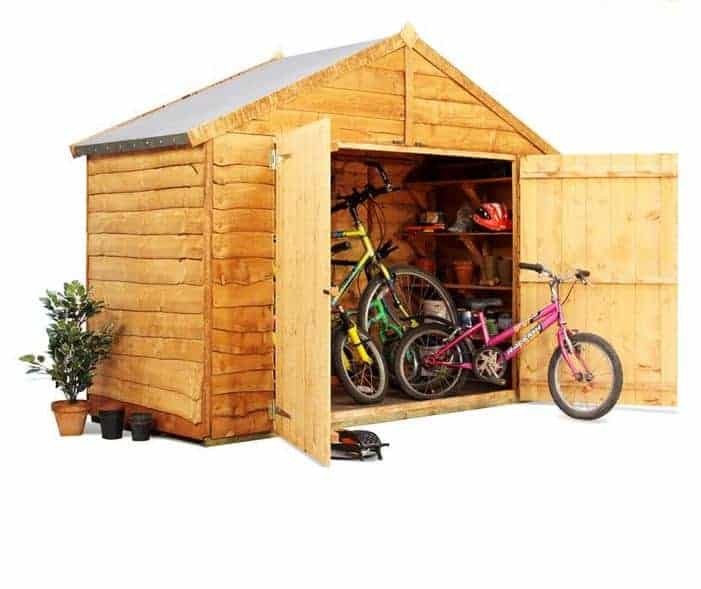 This bike shed is a fantastic looking structure with a very stylish rustic design that sets it apart from all the other bike stores. 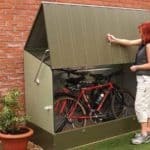 It is a practical, but very interesting looking structure, it will store your bicycles away from the weather and keep them safe from thieves. 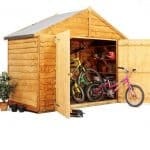 Those large double doors make getting your bike out and putting it back once you have finished, nice and easy. The whole bike store is not just easy on the eyes as it has been designed with functionality in mind so you will have no excuse to leave your bike out in the rain ever again. The cladding used here has a truly amazing look and right behind that is one very strong frame that is going to ensure this is a structure that you are going to get many years of use out of. The apex roof has been made so that the rain will run of the sides and away from the doors. 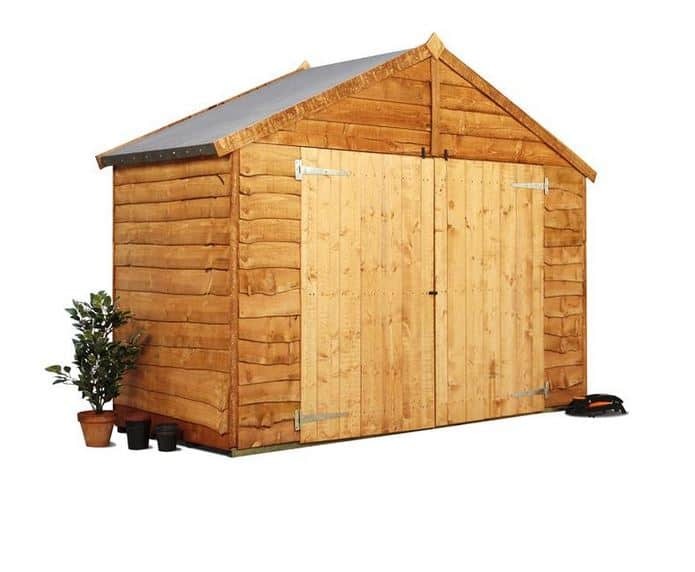 Those doors will be kept closed even in the worst wind thanks to a simple, but very effective turn button catch. In all this is a well made and very reasonably priced bike store that is going to give you many years of service. We have seen a few bike stores from BillyOh and this one here is one of their more compact bike stores. This particular one, The BillyOh Apex Bike Store, is not their smallest one though as there is one a little smaller than this which puts this one close to the middle of this range. So this one here is for those of you who do not have a ton of space for something like this or even if you just do not want a bike sore taking up major real estate in your garden. 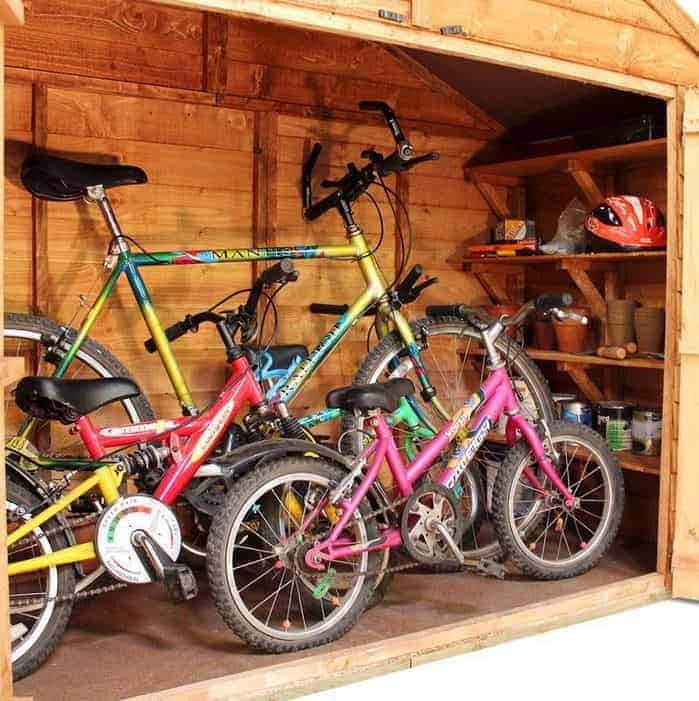 At a little under 7 feet wide and just a little over 3 feet deep, you have more than enough room to comfortably store three adult sized bikes. The height is 5 feet 3 inches along the ridge so getting a bike in and out is simply a case of lifting it up and placing it inside there is no need to twist or turn it, unless the kids have dumped their bike on the floor just inside the store of course. We actually really like what BillyOh have done with the roof inside this bike store. They have not gone for anything fancy, instead they have gone for good ol, reliable solid sheet boarding which is covered with some heavy duty mineral felt that is going to keep the rain from rusting up your bikes. The standard type of cladding that is used for this bike store is rustic cladding and we really like the look of this as it is something you do not see all the time. It has a very old school kind of look and it is very well made so no rain is going to be able to get through it. 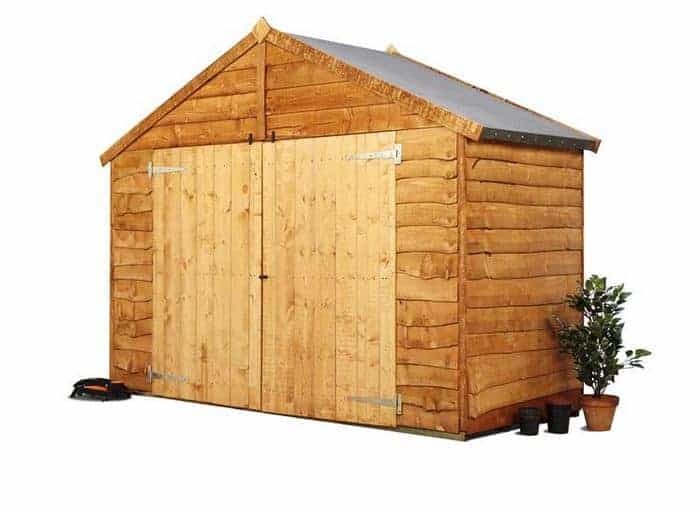 BillyOh do offer upgrades for the cladding. 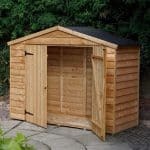 For an extra £10 you can upgrade to overlap cladding and for an extra £20 you can upgrade to tongue and groove cladding. A bike store has to be strong in order to take getting bikes thrown inside of it and to make sure this is one very strong bike store, BillyOh have used a very impressive frame. What we like about this frame is not just how it keeps the bike store very robust, but also how it does not stick out and get in the way. BillyOh do not actually include a floor with this bike store so it would need to be installed on a concrete surface or perhaps a decking area. If you have an area like this then you will not really need to worry about a floor. 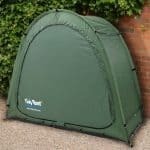 However if you are going to be installing this on grass or if you would just like there to be an actual floor inside, then you will need to take up one of their flooring options. Their cheapest floor options is their economy solid sheet boarding floor which costs £12.25, but if you want something a little bit more robust then they have a premium tongue and groove flooring for a cost of £15.36. 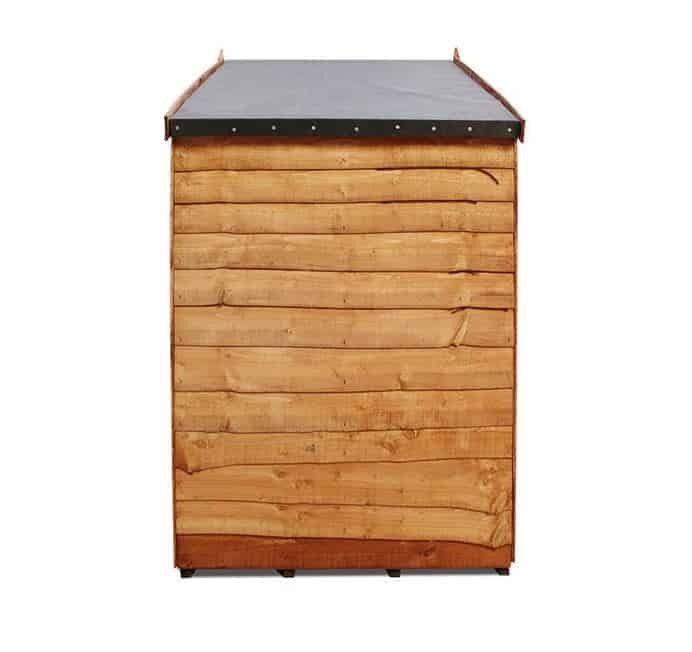 European softwood is what this bike store is made from and if you want to make sure The BillyOh Apex Bike Store stays looking great then you will have to give it a coating of wood treatment. Now it is important to note that no matter what cladding you go for, treatment will still have to be applied as only a basecoat will be applied by BillyOh. A fresh coat once a year is enough to keep the wood free from rot and decay. 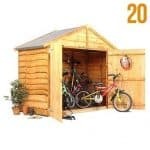 As is the case with the other BillyOh bike stores this one comes with a two year guarantee, but again like the others, you have to treat the wood for this guarantee to be valid. 3 feet 8 inches is the width and 4 feet 8 inches the height of those awesome looking double doors. We really like what they have done with these doors as it is going to make putting your bike away after a fun ride no problem at all. The doors are kept where they are supposed to be thanks to some very strong hinges. Hinges so strong that when you tell the kids to go out and put their bike away they will be able to handle the slamming shut that will occur. BillyOh must have a hunch that you have a pretty amazing bike so they made the smart decision not to advertise it to any thieves by not having any windows on the bike store. 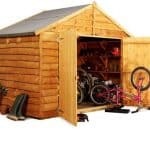 In general we are very pleased with what a secure bike store BillyOh have made and that door will keep shut even in the worst wind thanks to the turn button catch, but as great as that catch is it is not going to keep out a bike thief so you will certainly want to add a pad bolt and lock to the doors. 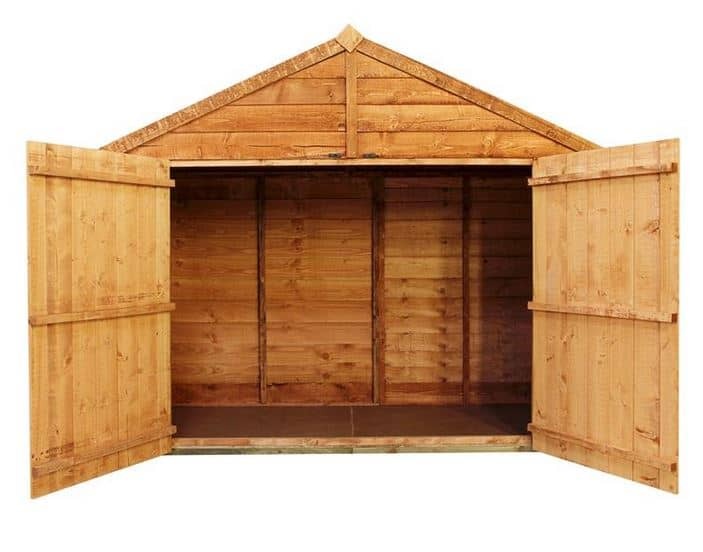 The lack of windows make this a very private structure so there will be none of your goods on display here. BillyOh go all out when it comes to letting you customise the colour of the bike store. To start with they have 12 different colours to choose from from. These start at, £7.95 for more basic colours such as, Dark Brown and go up to, £24.95 for colours that are a little bit more vibrant like, Lilac. As well as the actual bike store they have a selection of colours for the trim as well. they have cream, black and slate grey so be sure to have a think about what trim colour goes best with the wood colour you like. We have already talked about the different flooring and cladding that is on offer, but there are a couple of other extras that you may be interested in. There is the BillyOh Deluxe Padlock And Hasp which costs a very reasonable £8.99 and is something we highly recommend you consider. They also have a BillyOh Value Assembly Kit, which costs £19.95. We really like this bike store and feel that for the price, BillyOh have done a great job in not cutting any corners in the quality department. As long as you treat the wood there is no reason as to why you will not get 20 plus years of use out of this. The materials used are made to last and also to take a bit of abuse as well. This is one of the smaller bike stores from BillyOh, but it still offers you enough room to comfortably store three adult sized bikes and a few other items as well. The good thing about the size of this bike store is that even those with smaller gardens should be able to use this. We do not think this is one of the harder installation jobs we have seen. So get a friend to help you out and you should be done in around 6 hours. This is a very fairly priced bike store and even the extras like the flooring and cladding upgrades are very reasonably priced. Final Thoughts: The BillyOh Apex Bike Store is another well made product from BillyOh and it is going to be the best way to keep your bikes safe away from the rain and bike thieves. Even though the price is low, the quality is not and we are actually very impressed with what BillyOh have done here. Even if you did decide to upgrade the cladding and purchase a floor the added expense will not be all that much. 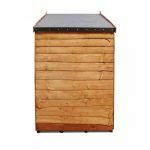 In all we are very impressed with this and are sure that due to the way it is made, low cost and longevity that it is going to be something you really like as well. For the price, I think that this was an amazing deal. It was such a steal because the price was so low. The size is kind of small, but not way too small for me to store my bike and other accessories in. The big double doors were such an advantage, and it is really secure to keep away from intruders; that is another part I really liked about it. The strength would withhold different storms which was nice because the storms were pretty wicked where I live. I am glad I chose this bike shed. I don’t have to worry about my bikes getting ruined from being outside now.